UFW Stories: "Florida UFW 1975-1993"
I came back to Washington, DC from Texas a very angry young man. My conservatism had been shaken to its roots by being a military veteran from an immoral war, a succession of bad employers in Louisiana and Texas and a run in with the Dallas police. Coming very close to a violent life I had the good fortune to meet Dolores Huerta at a peace rally in the 1970s in Washington DC. Dolores was not at all overwhelmed by the size of the crowd of many thousands or by the political “superstars” on the podium. She told the crowd that it was good that they came but if they sincerely wanted change they would have to learn to organize like the farm workers union. I had also noticed earlier that it was volunteers from the Washington, DC boycott office that came and did most of the setup work for the huge rally at the Jefferson Memorial.. The next day I called the office and volunteered to help with printing and photography. Director Stephanie Caiola accepted my offer and a few months later asked me to travel to Florida and take pictures of the UFW’s work there in the citrus groves with the Coca-Cola Minute Maid workers. In Florida I was fortunate to meet Cesar Chavez and take photos of his tour around the state. Cesar was a very humble man who loved the workers and their families. He arrived at a retreat center in Avon Park and promptly helped people in the kitchen prepare the meal. After the meeting he pulled a group of children together and talked to them about having pride in being the children of farm workers. I returned home, quit my jobs and returned to Florida where I worked with the movement in various positions with the late Rev. Fred Eyster of the National Farm Worker Ministry and Stephen Roberson UFW State Director. Frank Ortiz and Ben Maddock in California were great support for our campaigns in Florida. Fr. Joe Owens and Sr. Pat Drydyk also ran the NFWM. My work included building support committees in the Tampa Bay Area, Boycott work on grapes, lettuce, Ralston Purina, Luckies Super Markets and Publix. Our consumer campaign against Publix was the 1st victory of its type, followed up later against Kash & Karry (Luckies). Our political work included the victory of Perry Harvey, Tampa’s first African American city council member and Helen Gordon Davis a progressive state senator. Returning to Washington, DC during a brief burnout period Dolores asked me to help lobby on the Simpson Mazzoli immigration bill. Earlier two van loads of us from Florida went to Houston, Texas to assist Ted Kennedys’ Presidential primary campaign. We carried all the precincts that our volunteers worked in. It was during this campaign that I realized that I wanted to be an organizer. Fred and Stephen trained the Florida staff with the organizing methods of Cesar, Dolores and Fred Ross, Sr. We built 31 organizing committees and held 4 state conventions attended by up to 1000 farm workers and supporters. There were successful lawsuits, political campaigns, marches and strikes that resulted in wage increases for farm workers on both coasts. Union staff in Florida included among others, Neal Berinhout, Ken Snodgrass, Rev. David Smith, Maria Pearson, Lorenzo Sanchez, Hazel Filoxsian, Harry Marshall and committed farm workers like Br. Joel Rolle, Humberto Ramirez, Tirso Moreno, Hilario Barajas, Matias Cruz and Roberto Gamez.. On Cesar’s tragic passing a memorial service was held in Fort Pierce attended by nearly 1000 people. Our support committees included dedicated volunteers like John Streater, Rev. John Powers and Rosa Curras in Tampa, Barbara Porte’ in Orlando, Marianne Cafiero in Miami and hundreds more. The Sisters of Apopka did great work and supporters in the churches like Fr. Frank O’Loughlin, Fr. Gerald Redden, Msgr. McMahon, Fr. Nicanor Lobato and Fr. Diez made our work so much easier. 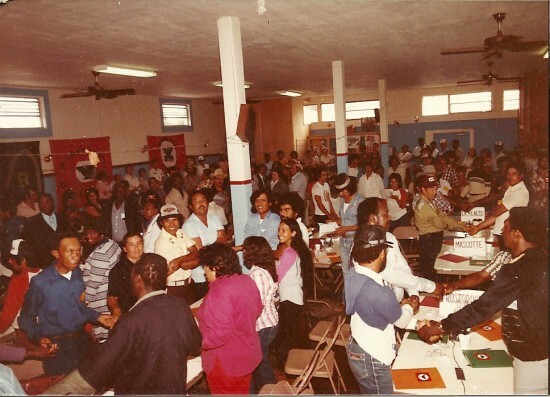 The UFW taught advanced organizing methods, strategic planning and hard work to thousands of us as volunteers. My later political work in Maryland and now with Sinn Fein in Ireland has been successful only because of my time with the UFW. Thank you Dolores! Como Siempre….